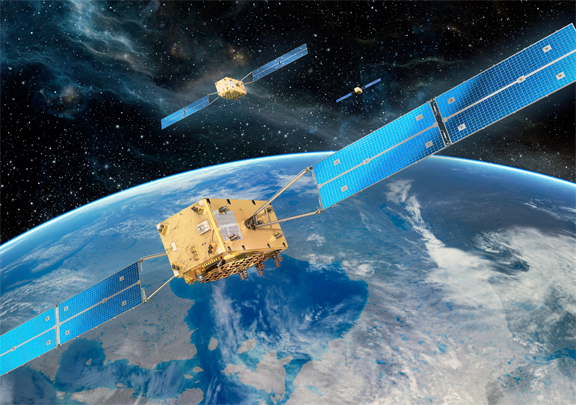 [Satnews] The European Commission, as the Program Manager of the Galileo Program, has decided to speed up the deployment of the Galileo space segment by adding a Soyuz launch in 2016, based on the confirmed availability of the satellites built by OHB. The additional launch, planned for May 2016, will be carried out by Arianespace from the Guyana Space Center in French Guyana, within the scope of the company's contract with the European Space Agency (ESA). It will orbit two FOC (Full Operational Capability) satellites, and precedes Arianespace's already scheduled launch of four Galileo satellites on an Ariane 5 ES during the fourth quarter of 2016. With these two launches, six new Galileo satellites will be deployed in 2016, as in 2015, bringing the total number in the constellation to 18 by the end of the year. The European Union's Galileo program aims to develop a complete global satellite navigation system, under civilian control. The system will be comprised of 30 satellites, of which 12 have already been orbited by Arianespace. Including this latest mission, Arianespace's launch manifest for 2016 now comprises a total of 12 launches from the Guyana Space Center. Arianespace Chairman and Chief Executive Officer Stéphane Israël said: "We will be orbiting six Galileo satellites in 2016, two with Soyuz and four with Ariane 5, clearly showing that our launcher family perfectly matches Europe's requirements."